Title : 100237: NPR: 02-06-2010 Wait Wait... Don't Tell Me! feed : 100237: NPR: 02-06-2010 Wait Wait... Don't Tell Me! Title : NPR: 01-30-2010 Wait Wait... Don't Tell Me! Are you noticing this issue only with this particular podcast? When does the naming correct itself? After closing and reopening or after next podcast? 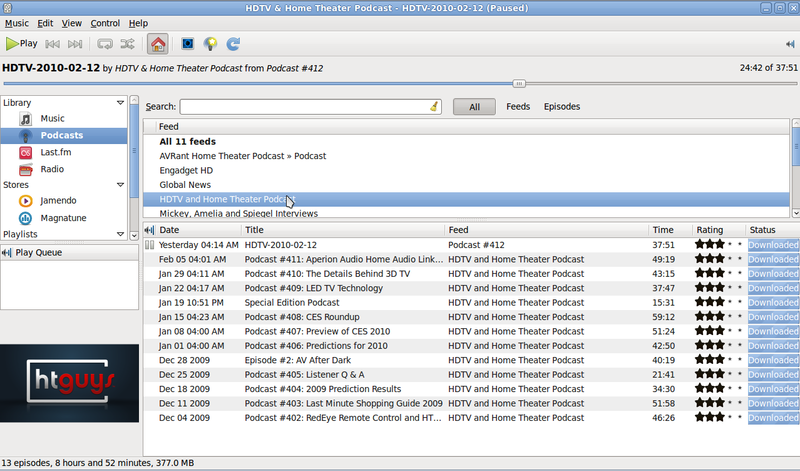 it looks like the info in the feeds ( xml , rss, etc... ) gets replaced by what info is in the podcast file itself. I think the old way makes more sense from a users point of view. @Jaakan is this issue still affecting you under rhythmbox 0.12.8-0ubuntu1? Thanks!